The term 'ballroom dancing' is derived from the word ball which in turn originates from the Latin word ballare which means 'to dance' (a ball-room being a large room specially designed for such dances). In times past, ballroom dancing was social dancing for the privileged, leaving folk dancing for the lower classes. These boundaries have since become blurred. The definition of ballroom dance also depends on the era: balls have featured popular dances of the day such as the Minuet, Quadrille, Polonaise, Polka, Mazurka, and others, which are now considered to be historical dances. In 1650 the Minuet, originally a peasant dance of Poitou, was introduced into Paris and set to music by Jean-Baptiste Lully and danced by the King Louis XIV in public. The Minuet dominated the ballroom from that time until the close of the 18th century. Toward the latter half of the 16th century, Louis XIV founded his 'Académie Royale de Musique et de Danse', where specific rules for the execution of every dance and the "five positions" of the feet were formulated for the first time by members of the Académie. Eventually, the first definite cleavage between ballet and ballroom came when professional dancers appeared in the ballets, and the ballets left the Court and went to the stage. Ballet technique such as the turned out positions of the feet, however, lingered for over two centuries and past the end of the Victoria era. Modern ballroom dance has its roots early in the 20th century, when several different things happened more or less at the same time. The first was a movement away from the sequence dances towards dances where the couples moved independently. This had been pre-figured by the waltz, which had already made this transition. The second was a wave of popular music, such as jazz. Since dance is to a large extent tied to music, this led to a burst of newly invented dances. There were many dance crazes in the period 1910–1930. The third event was a concerted effort to transform some of the dance crazes into dances which could be taught to a wider dance public in the U.S. and Europe. Here Vernon and Irene Castle were important, and so was a generation of English dancers in the 1920s, including Josephine Bradley and Victor Silvester. These professionals analysed, codified, published, and taught a number of standard dances. It was essential, if popular dance was to flourish, for dancers to have some basic movements they could confidently perform with any partner they might meet. Here the huge Arthur Murray organisation in America, and the dance societies in England, such as the Imperial Society of Teachers of Dancing, were highly influential. Finally, much of this happened during and after a period of World War, and the effect of such a conflict in dissolving older social customs was considerable. Later, in the 1930s, the on-screen dance pairing of Fred Astaire and Ginger Rogers influenced all forms of dance in the U.S. and elsewhere. Although both actors had separate careers, their filmed dance sequences together, which included portrayals of the Castles, have reached iconic status. 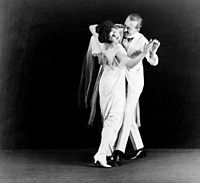 Much of Astaire and Rogers' work portrayed social dancing, although the performances were highly choreographed (often by Astaire or Hermes Pan) and meticulously staged and rehearsed. Ballroom dance competitions are regulated by each country in its own way. There are about 30 countries which compete regularly in international competitions. There are another 20 or so countries which have membership of the WDC and/or the WDSF, but whose dancers rarely appear in international competitions. In Britain there is the British Dance Council, which grants national and regional championship titles, such as the British Ballroom Championships, the British Sequence Championships and the United Kingdom Championships. In the United States, the member branches of the WDC (National Dance Council of America) and the WDSF (USA Dance) both grant national and regional championship titles. Ballroom dancing competitions in the former USSR also included the Soviet Ballroom dances, or Soviet Programme. Australian New Vogue is danced both competitively and socially. In competition, there are 15 recognized New Vogue dances, which are performed by the competitors in sequence. These dance forms are not recognized internationally, neither are the US variations such as American Smooth, and Rhythm. Such variations in dance and competition methods are attempts to meets perceived needs in the local market-place. Internationally, the Blackpool Dance Festival, hosted annually at Blackpool, England is considered the most prestigious event a dancesport competitor can attend. In competitive ballroom, dancers are judged by diverse criteria such as poise, the hold or frame, posture, musicality and expression, timing, body alignment and shape, floor craft, foot and leg action, and presentation. Judging in a performance-oriented sport is inevitably subjective in nature, and controversy and complaints by competitors over judging placements are not uncommon. The scorekeepers—called scrutineers—will tally the total number recalls accumulated by each couple through each round until the finals when the Skating system is used to place each couple by ordinals, typically 1–6, though the number of couples in the final may vary. Sometimes, up to 8 couples may be present on the floor during the finals. Competitors dance at different levels based on their ability and experience. The levels are split into two categories, syllabus and open. The syllabus levels are newcomer/pre-bronze, bronze, silver, and gold—with gold the highest syllabus level and newcomer the lowest. In these levels, moves are restricted to those written in a syllabus, and illegal moves can lead to disqualification. Each level, bronze, silver, and gold, has different moves on their syllabus, increasing in difficulty. There are three levels in the open category; novice, pre-champ, and champ in increasing order of skill. At those levels, dancers no longer have restrictions on their moves, so complex routines are more common. Medal evaluations for amateurs enable dancers' individual abilities to be recognized according to conventional standards. In medal evaluations, which are run by bodies such as the Imperial Society of Teachers of Dancing (ISTD) and the United Kingdom Alliance (UKA), each dancer performs two or more dances in a certain genre in front of a judge. Genres such as Modern Ballroom or Latin are the most popular. Societies such as the ISTD and UKA also offer medal tests on other dance styles (such as Country & Western, Rock 'n Roll or Tap). In some North American examinations, levels include Newcomer, Bronze, Silver, Gold, Novice, Pre-championship, and Championship; each level may be further subdivided into either two or four separate sections. There is a part of the ballroom world dedicated to college students. These chapters are typically clubs or teams that have an interest in ballroom dancing. Teams hold fundraisers, social events, and ballroom dance lessons. Ballroom dance teams' goals are to have fun and learn to dance well. There is a strong focus on finding a compatible dance partner and bonding with teammates. There is also a competitive side to collegiate ballroom - collegiate teams often hold competitions and invite other teams to participate. These competitions are often run with many of the same rules are regular amateur competitions as outlined above, but are usually organized entirely by collegiate teams. Examples include the MIT Open Ballroom Dance Competition, Purdue Ballroom Classic, Cardinal Classic, Berkeley Classic, and Harvard Invitational. In Europe, Latin Swing dances include Argentine tango, mambo, Lindy Hop, swing boogie (sometimes also known as nostalgic boogie), and discofox. One example of this is the subcategory of cajun dances that originated in Acadiana, with branches reaching both coasts of the United States. Latin/Rhythm dances are commonly danced to contemporary Latin American music and (in case of jive) Western music. With the exception of a few traveling dances like samba and pasodoble, couples do not follow the line of dance but perform their routines more or less in one spot. In competitions, the women are often dressed in short-skirted Latin outfits while the men are outfitted in tight-fitting shirts and pants, the goal being to emphasize the dancers' leg action and body movements. Victor Fung and Anna Mikhed dancing a tango in 2006. The couple, dancing for the US, came third in the Professional World Championship 2009. Waltz began as a country folk dance in Austria and Bavaria in the 17th century. In the early 19th century it was introduced in England. It was the first dance where a man held a woman close to his body. When performing the dance, the upper body is kept to the left throughout all figures, follow's body leaves the right side of the lead while the head is extended to follow the elbow. Figures with rotation have little rise. Sway is also used on the second step to make the step longer and also to slow down the momentum by bringing the feet together. Waltz is performed for both International Standard and American Smooth. Viennese waltz originated in Provence area in France in 1559 and is recognized as the oldest of all ballroom dances. It was introduced in England as German waltz in 1812 and became popular throughout the 19th century by the music of Josef and Johann Strauss. It is often referred to as the classic “old-school” ballroom. Viennese Waltz music is quite fast. Slight shaping of the body moves towards the inside of the turn and shaping forward and up to lengthen the opposite side from direction. Reverse turn is used to travel down long side and is overturned. While natural turn is used to travel short side and is underturned to go around the corners. Viennese waltz is performed for both International Standard and American Smooth. Tango originated in Buenos Aires in the late 19th century. Modern Argentine tango is danced in both open and closed embraces which focuses on the lead and follow moving in harmony of the tango's passionate charging music. The tango's technique is like walking to the music while keeping feet grounded and allowing ankles and knees to brush against one another during each step taken. Body weight is kept over the toes and the connection is held between the dancers in the hips. Ballroom tango, however, is a dance with a far more open frame, often utilising strong and staccato movements. Ballroom tango, rather than Argentine tango, is performed in international competition. The foxtrot is an American dance, believed to be of African-American origin. It was named by a vaudeville performer Harry Fox in 1914. Fox was rapidly trotting step to ragtime music. The dance therefore was originally named as the “Fox’s trot”. The foxtrot can be danced at slow, medium, or fast tempos depending on the speed of the jazz or big band music. The partners are facing one another and frame rotates from one side to another, changing direction after a measure. The dance is flat, with no rise and fall like the waltz. The walking steps are taken as slow for the two beats per steps and quick for one beat per step. Foxtrot is performed for both International Standard and American Smooth. The quickstep is an English dance and was invented in the 1920s as a combination of faster tempo of foxtrot and the Charleston. It is a fast moving dance, so men are allowed to close their feet and the couples move in short syncopated steps. Quickstep includes the walks, runs, chasses, and turns of the original foxtrot dance, with some other fast figures such as locks, hops, and skips. Quick step is performed as an International Standard dance. The pasodoble originated from Spain and its dramatic bullfights. The dance is mostly performed only in competitions and rarely socially because of its many choreographic rules. The lead plays the role of the matador while the follow takes the role of the matador's cape, the bull, or even the matador. The chassez cape refers to the lead using the follow to turn them as if they are the cape, and the apel is when the lead stomps their foot to get the bull's attention. Pasodoble is performed as an International Latin dance. The Spanish bolero was developed in the late 18th century out of the seguidilla, and its popularization is attributed to court dancers such as Sebastián Cerezo. It became one of the most popular ballroom dances of the 19th century and saw many classical adaptations. However, by the 20th century it had become old-fashioned. A Cuban music genre of the same name, bolero, which became popular in the early 20th century, is unrelated to the Spanish dance. Although Cuban bolero was born as a form of trova, traditional singer/songwriter tradition from eastern Cuba, with no associated dance, it soon became a ballroom favorite in Cuba and all of Latin America. The dance most commonly represents the couple falling in love. Modern bolero is seen as a combination of many dances: like a slow salsa with contra-body movement of tango, patterns of rhumba, and rise and fall technique and personality of waltz and foxtrot. Bolero can be danced in a closed hold or singly and then coming back together. It is performed as an American Rhythm dance. Samba is the national dance of Brazil. The rhythm of samba and its name originated from the language and culture of West African slaves. In 1905, samba became known to other countries during an exhibition in Paris. In the 1940s, samba was introduced in America through Carmen Miranda. The international version of Ballroom Samba has been based on an early version of Brazilian Samba called Maxixe, but has since developed away and differs strongly from Brazilian Ballroom Samba, which is called Samba de Gafieira. International Ballroom Samba is danced with a slight bounce which is created through the bending and straightening the knee. It is performed as an International Latin dance, although most of its modern development has occurred outside Latin America. Rhumba came to the United States from Cuba in the 1920s and became a popular cabaret dance during prohibition. Rhumba is a ballroom adaptation of son cubano and bolero (the Cuban genre) and, despite its name, it rarely included elements of Cuban rumba. It includes Cuban motions through knee-strengthening, figure-eight hip rotation, and swiveling foot action. An important characteristic of rhumba is the powerful and direct lead achieved through the ball of the foot. Rhumba is performed for both International Latin and American Rhythm. Mambo was developed as an offshoot of danzón, the national dance of Cuba, in the late 1930s by Orestes López and his brother Cachao, of Arcaño y sus Maravillas. They conceived a new form of danzón influenced by son cubano, with a faster, improvised final section, which allowed dancers to more freely express themselves, given that danzón had traditionally a very rigid structure. In the 1940s, Dámaso Pérez Prado transformed the mambo from the charanga into the big band format, and took it to Mexico and the United States, where it became a "dance craze". Cha-cha-cha (sometimes called cha-cha in the US) was delevoped by Enrique Jorrín in the early 1950s, as a slower alternative to mambo. Cha-cha-cha is a flirtatious dance with many hip rotations and partners synchronising their movements. The dance includes bending and straightening of the knee giving it a touch of Cuban motion. Cha-cha is performed for both International Latin and American Rhythm. Swing in 1927 was originally named the Lindy Hop named by Shorty George Snowden. There have been 40 different versions documented over the years; most common is the East Coast swing which is performed in the American Smooth (or American Rhythm) only in the U.S. or Canada. The East Coast swing was established by Arthur Murray and others only shortly after World War II. Swing music is very lively and upbeat and can be danced to jazz or big band music. The swing dancing is a style with lots of bounce and energy. Swing also includes many spins and underarm turns. East Coast swing is performed as an American Rhythm dance. The jive is part of the swing dance group and is a very lively variation of the jitterbug. Jive originated from African American clubs in the early 1940s. During World War II, American soldiers introduced the jive in England where it was adapted to today's competitive jive. In jive, the man leads the dance while the woman encourages the man to ask them to dance. It is danced to big band music, and some technique is taken from salsa, swing and tango. Jive is performed as an International Latin dance. 4 time. On the European continent, the Viennese waltz is known simply as waltz, while the waltz is recognized as English waltz or Slow Waltz. ^ a b Franks A.H. 1963. Social dance: a short history. Routledge & Kegan Paul, London. ^ Silvester, Victor 1980. Old Time and sequence dancing. Barrie and Jenkins, London. ^ "History of Musical Film, by John Kenrick". Musicals101.com. 1996. Archived from the original on 11 May 2008. Retrieved 2008-05-29. ^ "Review of "Swing Time" (1936)". rogerebert.com. 1998-02-15. Archived from the original on 2008-05-03. Retrieved 2008-05-29. ^ Complete listings of affiliations are given in the programmes of the major competitions. ^ "Ballroom 101". USA Dance, Inc. Archived from the original on 13 April 2014. Retrieved 9 April 2014. ^ "History of Modern Ballroom Dancing". Archived from the original on 26 February 2007. Retrieved 20 February 2007. .
^ "International Style - DanceCentral.info". www.dancecentral.info. Archived from the original on 2017-05-14. Retrieved 2017-05-05. ^ "Ballroom Dance Styles | America's Ballroom Challenge | PBS". Ballroom Dance Styles | America's Ballroom Challenge | PBS. Archived from the original on 2017-05-05. Retrieved 2017-05-05. ^ "Just Dance Ballroom :: Dance Styles". www.justdanceballroom.com. Archived from the original on 2017-04-29. Retrieved 2017-05-05. ^ Daniel, Yvonne (2009). "Rumba Then and Now". In Malnig, Julie. Ballroom, Boogie, Shimmy Sham, Shake: A Social and Popular Dance Reader. Chicago, IL: University of Illinois. p. 162. Arthur Murray "How To Become A Good Dancer" Published: 1938 ISBN 1447416767, 9781447416760 250 pages. Abra, Allison. "Review of James Nott, Going to the palais: a social and cultural history of dancing and dance halls in Britain, 1918–1960." Contemporary British History (Sep 2016) 30#3 pp 432–433.